The team practices as one unit, but fields both junior varsity and varsity squads when JV opportunities arise . Student athletes in grade 6 may play junior varsity, which includs 6th-10th grade. The varsity team consists of 7th - 12th graders, so there is overlap. While older high school players normally get more playing time, younger players -- especially those with experience and skill -- are developed in and around the older leaders. As with many high school volleyball programs, LPA's top players have extensive club experience. Helpfully, however, several less-experienced players joined the program. Encouraged by the coaches and experienced players, these new athletes should begin hitting their stride in the coming season. 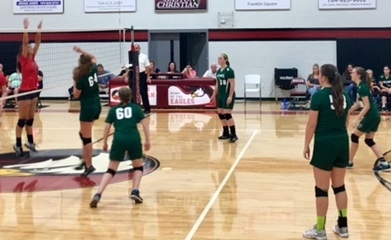 Lake Pointe competes in the 2-A division of the South Carolina Association of Christian Schools (SCACS) league. That season is a fall schedule. LPA does not have a gym on its campus. Practices and home games are played at Lake Wylie Christian Assembly. The Mariners are grateful for Lake Wylie Christian Assembly's generosity and hospitality. Lake Pointe's inaugural varsity girls' volleyball team started in the fall of 2009. Kristal Luke led the volleyball team to their first play-off appearance in her first year of coaching.